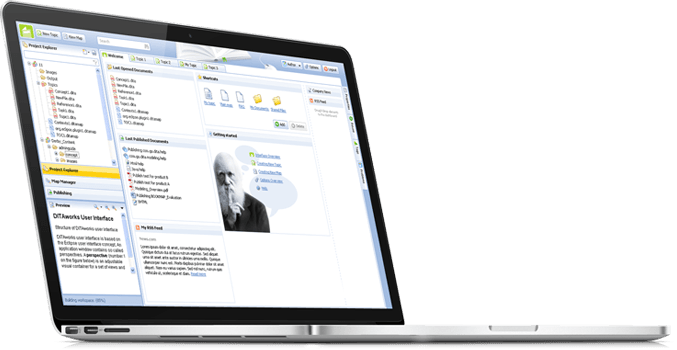 DITAworks is an enterprise-grade DITA CMS (Content Management System) for authoring, managing and publishing DITA content. It is designed for enterprise content management of structured content and complex documentation or documentation arrays with a unified content reuse mechanism. DITAworks combines state-of-the-art technology with hands-on experience garnered from working with various enterprises. Its flexibility and scalability will future-proof your investment and make it fit your needs as and when they change. Your content is never locked in as a result of the use of open industry standards. DITAworks CMS is industry-independent and is already working very effectively in a varied range of industries. All the industries benefit from the core concepts of DITAworks enterprise content management which include content reuse, ease of handling content, high quality content authoring, optimized content infrastructure, streamlined workflow, single-source publishing and a solid component content management. DITAworks DITA content management system establishes a cost-effective enterprise content management process as a result of using the Single Source principle and reusing content. Thanks to content reuse the amount of text segments that require translation are greatly diminished, considerably reducing the cost. Save time due to content reuse and support of different versions and variations. Benefit from component content management features and reuse support provided by DITAworks document management software! Make complex and time consuming DITA content management, modeling, authoring, publishing and review tasks easier through an optimized, role-based user interface and out-of-the-box processes. Customize documentation for particular clients and different implementations all the while increasing the accuracy of the documentation. Increase both the quality of your documentation and the relationship with your clients by providing accurate and up-to-date information. Support available 24/7 through customer-friendly and flexible publishing. Minimalism, clear structure, content reuse, and Single-Source publishing reduce the total cost of ownership and allow for higher return on investment. 19.12.2017*instinctools Wishes You Happy Holidays and a Happy New Year 2018 ! 30.12.2016DITAworks team wishes relaxing and joyful holidays! 15.11.2016DITAworks CMS now with oXygen XML web author!